Following in Coachella’s footsteps, this week Sasquatch Festival announced that it has sold out too. I guess fans are excited to see Foo Fighters, The Flaming Lips, Wilco, Modest Mouse and the rest of the lineup live in The Gorge again. But we’re wondering…is there a sellout conspiracy going on? Is there a connection between Radiohead and The Dancing Guy? And what about the mental health of concert fans? What Is Really A Sell Out? Yes, I’m sure on one level the Sasquatch 2011 lineup does have something to do with it. And yes, the Sasquatch festival, like Lollapalooza, Coachella and Bonnaroo, has survived emerged as a successful festival brand and a popular destination for concert fans in the Pacific Northwest. But on another level, these one-week sellouts make me go hmmm. The one-week sellouts stir up skepticism, because when you consider that Sasquatch is promoted by Live Nation-Ticketmaster, and Coachella is promoted by AEG Live, you have to wonder who is really “buying” the bulk of the tickets. And you really have to wonder…is this just a showdown between the number one (Live Nation) and number two (AEG Live) concert promoter in the world? Probably. Sure increasing demand and creating hype is nothing new for the concert industry, but still you have to wonder about the details for the fan sake? Is this just a silly game to see who’s secondary market partners can scoop up the tickets the fastest and sell them back to fans at a higher cost in the scalpers market? I have my doubts that these sellouts are legit when fans are still having to make tough choices on where to spend their money for shows. I’m not trying to start any sellout conspiracies, but I’m just saying that when the concert industry reports a down year in 2010 and then starts reporting record sell outs to their top music festivals, you have to wonder what is really going on here. And when summer musical festivals were the only bright spot for the concert industry and the major promoters in 2011, you REALLY have to wonder how much the fan will be the victims as their the ones who will pay the most in this questionable sellout scenario. If this is true, then this is certainly a reason to start a Concert Fan Complaints Choir. Are The Sasquatch Dancing Guy and Tom Yorke Buddies? All sellout conspiracies considered, we haven’t officially confirmed the our friend Colin Wynter, aka the Dancing Guy from 2009 Sasquatch Festival, will be at 2011 shindig. Continuing our Radiohead experiment, I watched the video for Radiohead’s “Lotus Flower,” a track from their new album King of Limbs, and notice several similarities in dance styles and body movements between Yorke’s (video below) and Wynter’s funky and free-form dancing performances. That said, I’m wondering if Mr. Yorke and Mr. Wynter got together and had a private session to compare and mashup their dance moves. Or perhaps, Mr. Yorke watched the Dancing Guy viral video and was inspired to create his own interpreted version for the video. Again, this is all pure speculation, but it’s worth exploring for the fun of it. I bet we’ll see many Radiohead fans recreating the dance during future live shows. And who knows, maybe Derek Sivers and Ted.com will feature Yorke for his dancing moves just like they featured Wynter last year in the very amusing and somewhat ridiculous how to start a movement Ted Talk. Would Sivers rework his leadership theory if he had read our interview with The Dancing Guy? Looking ahead, we’ll be sure to touch base with Wynter and let you know if he’s planning to start a swarm at this year’s Sasquatch Festival. Cruising around the Sasquatch site, I was also pleased to discover that To Write Love on Her Arms was in attendance last year. It’s great to see organizations like TWLOHA at Sasquatch Festival. And I hope the presence of TWLOHA and other similar groups is a growing trend, because as we explored ways to improve the fan experience, we know groups like TWLOHA are desperately needed at Lollapalooza and other major summer music festivals like Coachella and Bonnaroo. And if concert fans are going to be caught in the middle of concert promoters and ticket scalpers, our mental health is going to need some TLC for sure. Sasquatch Mobile App or Contests? As of today, I didn’t see any news or updates about Sasquatch mobile apps or contests, but we’ll be sure to let you know when there is. 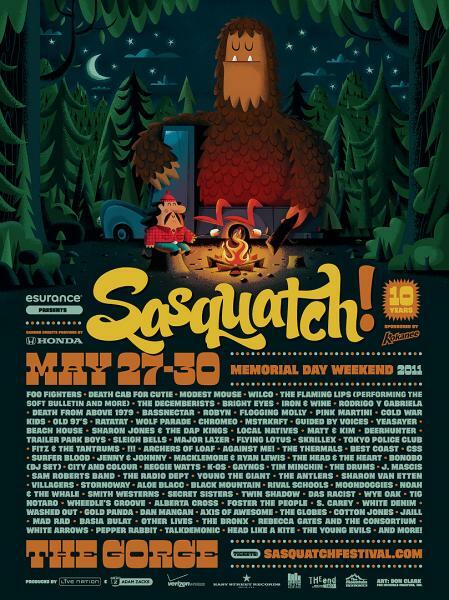 Are you planning to head out to Sasquatch this year? Do you have a Sasquatch concert story? Share it below! Sasquatch tickets have been available since November, which is when I bought mine. More like a 3 month sellout and the finalized lineup announcement just scooped up the rest of the tickets.